IEDs are generally seen in heavy terrorist actions or in asymmetric unconventional warfare by insurgent guerrillas or commando forces in a theatre of operations. In the second Iraq War, IEDs were used extensively against US-led invasion forces and by the end of 2007 they had become responsible for approximately 63% of coalition deaths in Iraq. They are also used in Afghanistan by insurgent groups, and have caused over 66% of coalition casualties in the 2001–present Afghanistan War. IEDs were also used extensively by cadres of the rebel Tamil Tiger (LTTE) organisation against military targets in Sri Lanka. An IED is a bomb fabricated in an improvised manner incorporating destructive, lethal, noxious, pyrotechnic, or incendiary chemicals and designed to destroy or incapacitate personnel or vehicles. In some cases, IEDs are used to distract, disrupt, or delay an opposing force, facilitating another type of attack. IEDs may incorporate military or commercially sourced explosives, and often combine both types, or they may otherwise be made with homemade explosives (HME). An HME lab refers to a Homemade Explosive Lab, or the physical location where the devices are crafted. An IED has five components: a switch (activator), an initiator (fuse), container (body), charge (explosive), and a power source (battery). An IED designed for use against armoured targets such as personnel carriers or tanks will be designed for armour penetration, by using a shaped charge that creates an explosively formed penetrator. IEDs are extremely diverse in design and may contain many types of initiators, detonators, penetrators, and explosive loads. Antipersonnel IEDs typically also contain fragmentation-generating objects such as nails, ball bearings or even small rocks to cause wounds at greater distances than blast pressure alone could. In the conflicts of the 21st century, anti-personnel improvised explosive devices (IED) have partially replaced conventional or military landmines as the source of injury to dismounted (pedestrian) soldiers and civilians. These injuries were reported in BMJ Open to be far worse with IEDs than with landmines resulting in multiple limb amputations and lower body mutilation. This combination of injuries has been given the name "Dismounted Complex Blast Injury" and is thought to be the worst survivable injury ever seen in war. IEDs are triggered by various methods, including remote control, infrared or magnetic triggers, pressure-sensitive bars or trip wires (victim-operated). In some cases, multiple IEDs are wired together in a daisy chain to attack a convoy of vehicles spread out along a roadway. IEDs made by inexperienced designers or with substandard materials may fail to detonate, and in some cases, they actually detonate on either the maker or the placer of the device. Some groups, however, have been known to produce sophisticated devices constructed with components scavenged from conventional munitions and standard consumer electronics components, such as mobile phones, consumer-grade two-way radios, washing machine timers, pagers, or garage door openers. The sophistication of an IED depends on the training of the designer and the tools and materials available. IEDs may use artillery shells or conventional high-explosive charges as their explosive load as well as homemade explosives. However, the threat exists that toxic chemical, biological, or radioactive (dirty bomb) material may be added to a device, thereby creating other life-threatening effects beyond the shrapnel, concussive blasts and fire normally associated with bombs. Chlorine liquid has been added to IEDs in Iraq, producing clouds of chlorine gas. A vehicle-borne IED, or VBIED, is a military term for a car bomb or truck bomb but can be any type of transportation such as a bicycle, motorcycle, donkey (DBIED), etc. They are typically employed by insurgents in particular ISIS, and can carry a relatively large payload. They can also be detonated from a remote location. VBIEDs can create additional shrapnel through the destruction of the vehicle itself and use vehicle fuel as an incendiary weapon. The act of a person's being in this vehicle and detonating it is known as an SVBIED suicide. Of increasing popularity among insurgent forces in Iraq is the house-borne IED, or HBIED from the common military practice of clearing houses; insurgents rig an entire house to detonate and collapse shortly after a clearing squad has entered. The Dictionary of Military and Associated Terms (JCS Pub 1-02) includes two definitions for improvised devices: improvised explosive devices (IED) and improvised nuclear device (IND). These definitions address the Nuclear and Explosive in CBRNe. That leaves chemical, biological and radiological undefined. Four definitions have been created to build on the structure of the JCS definition. Terms have been created to standardize the language of first responders and members of the military and to correlate the operational picture. A device placed or fabricated in an improvised manner incorporating destructive, lethal, noxious, pyrotechnic, or incendiary chemicals and designed to destroy, incapacitate, harass, or distract. It may incorporate military stores, but is normally devised from non-military components. IEDs have been deployed in the form of explosively formed projectiles (EFP), a special type of shaped charge that is effective at long standoffs from the target (50 meters or more), however they are not accurate at long distances. This is because of how they are produced. The large "slug" projected from the explosion has no stabilization because it has no tail fins and it does not spin like a bullet from a rifle. Without this stabilization the trajectory can not be accurately determined beyond 50 meters. An EFP is essentially a cylindrical shaped charge with a machined concave metal disc (often copper) in front, pointed inward. The force of the shaped charge turns the disc into a high velocity slug, capable of penetrating the armor of most vehicles in Iraq. Directionally focused charges (also known as directionally focused fragmentary charges depending on the construction) are very similar to EFPs, with the main difference being that the top plate is usually flat and not concave. It also is not made with machined copper but much cheaper cast or cut metal. When made for fragmentation, the contents of the charge is usually nuts, bolts, ball bearings and other similar shrapnel products and explosive. If it only consists of the flat metal plate, it is known as a platter charge, serving a similar role as an EFP with reduced effect but easier construction. A device incorporating the toxic attributes of chemical materials designed to result in the dispersal of these toxic chemical materials for the purpose of creating a primary patho-physiological toxic effect (morbidity and mortality), or secondary psychological effect (causing fear and behavior modification) on a larger population. Such devices may be fabricated in a completely improvised manner or may be an improvised modification to an existing weapon. A device incorporating biological materials designed to result in the dispersal of vector borne biological material for the purpose of creating a primary patho-physiological toxic effect (morbidity and mortality), or secondary psychological effect (causing fear and behavior modification) on a larger population. Such devices are fabricated in a completely improvised manner. A device making use of exothermic chemical reactions designed to result in the rapid spread of fire for the purpose of creating a primary patho-physiological effect (morbidity and mortality), or secondary psychological effect (causing fear and behavior modification) on a larger population or it may be used with the intent of gaining a tactical advantage. Such devices may be fabricated in a completely improvised manner or may be an improvised modification to an existing weapon. A common type of this is the Molotov cocktail. A speculative device incorporating radioactive materials designed to result in the dispersal of radioactive material for the purpose of area denial and economic damage, and/or for the purpose of creating a primary patho-physiological toxic effect (morbidity and mortality), or secondary psychological effect (causing fear and behavior modification) on a larger population. Such devices may be fabricated in a completely improvised manner or may be an improvised modification to an existing nuclear weapon. Also called a Radiological Dispersion Device (RDD) or "dirty bomb". Improvised nuclear device of most likely gun-type or implosion-type. Nanotechnology can theoretically be used to develop miniaturised laser-triggered pure fusion weapon that will be easier to produce than conventional nuclear weapons and could be used in terrorist attacks. A vehicle may be laden with explosives, set to explode by remote control or by a passenger/driver, commonly known as a car bomb or vehicle-borne IED (VBIED, pronounced vee-bid). On occasion the driver of the car bomb may have been coerced into delivery of the vehicle under duress, a situation known as a proxy bomb. Distinguishing features are low-riding vehicles with excessive weight, vehicles with only one passenger, and ones where the interior of the vehicles look as if they have been stripped down and built back up. Car bombs can carry thousands of pounds of explosives and may be augmented with shrapnel to increase fragmentation. The U.S. State Department has published a guide on car bomb awareness. ISIS has used truck bombs with devastating effects. Boats laden with explosives can be used against ships and areas connected to water. An early example of this type was the Japanese Shinyo suicide boats during World War II. The boats were laden with explosives and attempted to ram Allied ships, sometimes successfully, having sunk or severely damaged several American ships by war's end. Suicide bombers used a boat-borne IED to attack the USS Cole, US and UK troops have also been killed by boat-borne IEDs in Iraq. Monkeys and war pigs were used as incendiaries around 1000 AD. More famously the "anti-tank dog" and "bat bomb" were developed during World War II. In recent times, a two-year-old child and seven other people were killed by explosives strapped to a horse in the town of Chita in Colombia The carcasses of certain animals were also used to conceal explosive devices by the Iraqi insurgency. IEDs strapped to the necks of farmers have been used on at least three occasions by guerrillas in Colombia, as a way of extortion. American pizza delivery man Brian Douglas Wells was killed in 2003 by an explosive fastened to his neck, purportedly under duress from the maker of the bomb. In 2011 a schoolgirl in Sydney, Australia had a suspected collar bomb attached to her by an attacker in her home. The device was removed by police after a ten-hour operation and proved to be a hoax. Suicide bombing usually refers to an individual wearing explosives and detonating them in order to kill others including themselves, a technique pioneered by LTTE (Tamil Tigers). The bomber will conceal explosives on and around their person, commonly using a vest (or possibly a prosthetic) and will use a timer or some other trigger to detonate the explosives. The logic behind such attacks is the belief that an IED delivered by a human has a greater chance of achieving success than any other method of attack. In addition, there is the psychological impact of fighters prepared to deliberately sacrifice themselves for their cause. In May 2012 American counter-terrorism officials leaked their acquisition of documents describing the preparation and use of surgically implanted improvised explosive devices. The devices were designed to evade detection. The devices were described as containing no metal, so they could not be detected by X-rays. Security officials referred to bombs being surgically implanted into suicide bombers' "love handles". According to the Daily Mirror UK security officials at MI-6 asserted that female bombers could travel undetected carrying the explosive chemicals in otherwise standard breast implants. The bomber would blow up the implanted explosives by injecting a chemical trigger. Robots can be used to carry explosives. First such documented case was during the aftermath of 2016 shooting of Dallas police officers when a bomb disposal robot was used to deliver explosives to kill Micah Xavier Johnson, who was hiding in a place unaccesible to police snipers. ISIS and Al-Nusra have used bombs detonated in tunnels dug under targets. In 2008, rocket-propelled IEDs, dubbed Improvised Rocket Assisted Munitions, Improvised Rocket Assisted Mortars and (IRAM) by the military, came to be employed in numbers against U.S. forces in Iraq. They have been described as propane tanks packed with explosives and powered by 107 mm rockets. They are similar to some Provisional IRA barrack buster mortars. New types of IRAMs including Volcano IRAM and Elephant Rockets, are used during Syrian Civil War. 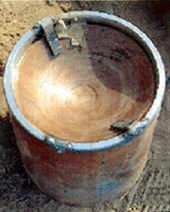 Improvised mortar has been used by many insurgent groups including during civil war in Syria and Boko Haram insurgency. IRA used improvised mortars called barrack busters. Improvised artillery including hell cannons are used by rebel forces during Syrian Civil War. Command-wire improvised, explosive devices (CWIED) use an electrical firing cable that affords the user complete control over the device right up until the moment of initiation. The trigger for a radio-controlled improvised explosive device (RCIED) is controlled by radio link. The device is constructed so that the receiver is connected to an electrical firing circuit and the transmitter operated by the perpetrator at a distance. A signal from the transmitter causes the receiver to trigger a firing pulse that operates the switch. Usually the switch fires an initiator; however, the output may also be used to remotely arm an explosive circuit. Often the transmitter and receiver operate on a matched coding system that prevents the RCIED from being initiated by spurious radio frequency signals or jamming. An RCIED can be triggered from any number of different mechanisms including car alarms, wireless door bells, cell phones, pagers and encrypted GMRS radios. A radio-controlled IED (RCIED) incorporating a mobile phone that is modified and connected to an electrical firing circuit. Mobile phones operate in the UHF band in line of sight with base transceiver station (BTS) antennae sites. In the common scenario, receipt of a paging signal by phone is sufficient to initiate the IED firing circuit. Victim-operated improvised explosive devices (VOIED), also known as booby traps, are designed to function upon contact with a victim. VOIED switches are often well hidden from the victim or disguised as innocuous everyday objects. They are operated by means of movement. Switching methods include tripwire, pressure mats, spring-loaded release, push, pull or tilt. Common forms of VOIED include the under-vehicle IED (UVIED), improvised landmines, and mail bombs. The British accused Iran and Hezbollah of teaching Iraqi fighters to use infrared light beams to trigger IEDs. As the occupation forces became more sophisticated in interrupting radio signals around their convoys, the insurgents adapted their triggering methods. In some cases, when a more advanced method was disrupted, the insurgents regressed to using uninterruptible means, such as hard wires from the IED to detonator; however, this method is much harder to effectively conceal. It later emerged however, that these "advanced" IEDs were actually old IRA technology. The infrared beam method was perfected by the IRA in the early '90s after it acquired the technology from a botched undercover British Army operation. Many of the IEDs being used against the invading coalition forces in Iraq were originally developed by the British Army who unintentionally passed the information on to the IRA. The IRA taught their techniques to the Palestine Liberation Organisation and the knowledge spread to Iraq. 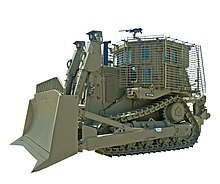 Israeli IDF Caterpillar D9 armored bulldozer, which is used by the IDF Combat Engineering Corps for clearing heavy belly charges and booby-trapped buildings. Counter-IED efforts are done primarily by military, law enforcement, diplomatic, financial, and intelligence communities and involve a comprehensive approach to countering the threat networks that employ IEDs, not just efforts to defeat the devices themselves. Because the components of these devices are being used in a manner not intended by their manufacturer, and because the method of producing the explosion is limited only by the science and imagination of the perpetrator, it is not possible to follow a step-by-step guide to detect and disarm a device that an individual has only recently developed. As such, explosive ordnance disposal (IEDD) operators must be able to fall back on their extensive knowledge of the first principles of explosives and ammunition, to try and deduce what the perpetrator has done, and only then to render it safe and dispose of or exploit the device. Beyond this, as the stakes increase and IEDs are emplaced not only to achieve the direct effect, but to deliberately target IEDD operators and cordon personnel, the IEDD operator needs to have a deep understanding of tactics to ensure he is neither setting up any of his team or the cordon troops for an attack, nor walking into one himself. The presence of chemical, biological, radiological, or nuclear (CBRN) material in an IED requires additional precautions. As with other missions, the EOD operator provides the area commander with an assessment of the situation and of support needed to complete the mission. Military and law enforcement personnel from around the world have developed a number of render-safe procedures (RSPs) to deal with IEDs. RSPs may be developed as a result of direct experience with devices or by applied research designed to counter the threat. 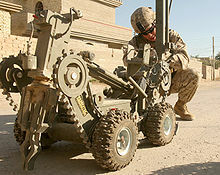 The supposed effectiveness of IED jamming systems, including vehicle- and personally-mounted systems, has caused IED technology to essentially regress to command-wire detonation methods. These are physical connections between the detonator and explosive device and cannot be jammed. However, these types of IEDs are more difficult to emplace quickly, and are more readily detected. Military forces and law enforcement from India, Canada, United Kingdom, Israel, Spain, and the United States are at the forefront of counter-IED efforts, as all have direct experience in dealing with IEDs used against them in conflict or terrorist attacks. From the research and development side, programs such as the new Canadian Unmanned Systems Challenge will bring student groups together to invent an unmanned device to both locate IEDs and pinpoint the insurgents. The fougasse was improvised for centuries, eventually inspiring factory-made land mines. Ernst Jünger mentions in his war memoir the systematic use of IEDs and booby traps to cover the retreat of German troops at the Somme region during the First World War. Another early example of coordinated large-scale use of IEDs was the Belarusian Rail War launched by Belarusian guerrillas against the Germans during World War II. Both command-detonated and delayed-fuse IEDs were used to derail thousands of German trains during 1943–1944. 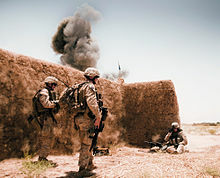 U.S. Marines with Explosive Ordnance Disposal (EOD) destroy an improvised explosive device cache in southern Afghanistan in June 2010. Starting six months before the invasion of Afghanistan by the USSR on 27 December 1979, the Afghan Mujahideen were supplied by the CIA, among others, with large quantities of military supplies. Among those supplies were many types of anti-tank mines. The insurgents often removed the explosives from several foreign anti-tank mines, and combined the explosives in tin cooking-oil cans for a more powerful blast. By combining the explosives from several mines and placing them in tin cans, the insurgents made them more powerful, but sometimes also easier to detect by Soviet sappers using mine detectors. After an IED was detonated, the insurgents often used direct-fire weapons such as machine guns and rocket-propelled grenades to continue the attack. Afghan insurgents operating far from the border with Pakistan did not have a ready supply of foreign anti-tank mines. They preferred to make IEDs from Soviet unexploded ordnance. The devices were rarely triggered by pressure fuses. They were almost always remotely detonated. Since the 2001 invasion of Afghanistan, the Taliban and its supporters have used IEDs against NATO and Afghan military and civilian vehicles. This has become the most common method of attack against NATO forces, with IED attacks increasing consistently year on year. According to a report by the Homeland Security Market Research in the US, the number of IEDs used in Afghanistan had increased by 400 percent since 2007 and the number of troops killed by them by 400 percent, and those wounded by 700 percent. 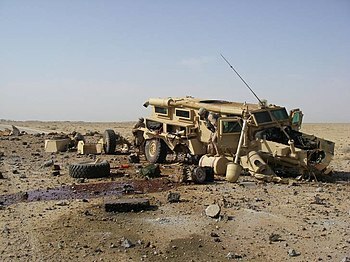 It has been reported that IEDs are the number one cause of death among NATO troops in Afghanistan. A brigade commander said that sniffer dogs are the most reliable way of detecting IEDs. However, statistical evidence gathered by the US Army Maneuver Support Center at Fort Leonard Wood, MO shows that the dogs are not the most effective means of detecting IEDs. The U.S. Army's 10th Mountain Division was the first unit to introduce explosive detection dogs in southern Afghanistan. In less than two years the dogs discovered 15 tons of illegal munitions, IED's, and weapons. In July 2012 it was reported that "sticky bombs", magnetically adhesive IED's that were prevalent in the Iraq War, showed up in Afghanistan. 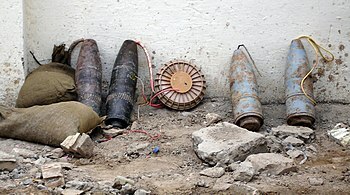 ISAF troops stationed in Afghanistan and other IED prone areas of operation would commonly "BIP" (blow in place) IED's and other explosives that were considered too dangerous to defuse. IEDs are being used by insurgents against government forces during the insurgency in Egypt (2013-present) and the Sinai insurgency. IEDs are increasingly being used by Maoists in India. On 13 July 2011, three IEDs were used by the Insurgency in Jammu and Kashmir to carry out a coordinated attack on the city of Mumbai, killing 19 people and injuring 130 more. On 21 February 2013, two IEDs were used to carry out bombings in the Indian city of Hyderabad. The bombs exploded in Dilsukhnagar, a crowded shopping area of the city, within 150 metres of each other. On 17 April 2013, two kilos of explosives used in Bangalore bomb blast at Malleshwaram area, leaving 16 injured and no fatalities. Intelligence sources have said the bomb was an Improvised Explosive Device or IED. On 21 May 2014, Indinthakarai village supporters of the Kudankulam Nuclear Power Plant were targeted by opponents using over half a dozen crude "country-made bombs". It was further reported that there had been at least four similar bombings in Tamil Nadu during the preceding year. On 28 December 2014, a minor explosion took place near the Coconut Grove restaurant at Church Street in Bangalore on Sunday around 8:30 pm. One woman was killed and another injured in the blast. During the 2016 Pathankot attack, several casualties came from IEDs. On 14 February 2019 in 2019 Pulwama attack, several casualties were reported due to IED blast. In the 2003–2011 Iraq War, IEDs have been used extensively against Coalition forces and by the end of 2007 they have been responsible for at least 64% of Coalition deaths in Iraq. Beginning in July 2003, the Iraqi insurgency used IEDs to target invading coalition vehicles. According to the Washington Post, 64% of U.S. deaths in Iraq occurred due to IEDs. A French study showed that in Iraq, from March 2003 to November 2006, on a global 3,070 deaths in the US-led invading coalition soldiers, 1,257 were caused by IEDs, i.e. 41%. That is to say more than in the "normal fights" (1027 dead, 34%). Insurgents now use the bombs to target not only invading coalition vehicles but Iraqi police as well. Common locations for placing these bombs on the ground include animal carcasses, soft drink cans, and boxes. Typically they explode underneath or to the side of the vehicle to cause the maximum amount of damage; however, as vehicle armour was improved on military vehicles, insurgents began placing IEDs in elevated positions such as on road signs, utility poles, or trees, in order to hit less protected areas. IEDs in Iraq may be made with artillery or mortar shells or with varying amounts of bulk or homemade explosives. Early during the Iraq war, the bulk explosives were often obtained from stored munitions bunkers to include stripping landmines of their explosives. Despite the increased armor, IEDs are killing military personnel and civilians with greater frequency. May 2007 was the deadliest month for IED attacks thus far, with a reported 89 of the 129 invading coalition casualties coming from an IED attack. According to the Pentagon, 250,000 tons (out of 650,000 tons total) of Iraqi heavy ordnance were looted, providing a large supply of ammunition for the insurgents. In October 2005, the UK government charged that Iran was supplying insurgents with the technological know-how to make shaped charge IEDs. Both Iranian and Iraqi government officials denied the allegations. During the Iraqi Civil War (2014–2017), ISIL has made extensive use of suicide VBIEDs, often driven by children, elderly and disabled. 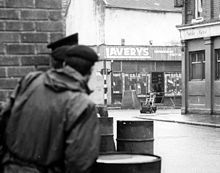 Throughout The Troubles, the Provisional IRA made extensive use of IEDs in their 1969–97 campaign. They used barrack buster mortars and remote controlled IEDs. Members of the IRA developed and counter-developed devices and tactics. IRA bombs became highly sophisticated, featuring anti-handling devices such as a mercury tilt switch or microswitches. These devices would detonate the bomb if it was moved in any way. Typically, the safety-arming device used was a clockwork Memopark timer, which armed the bomb up to 60 minutes after it was placed by completing an electrical circuit supplying power to the anti-handling device. Depending on the particular design (e.g., boobytrapped briefcase or car bomb) an independent electrical circuit supplied power to a conventional timer set for the intended time delay, e.g. 40 minutes. However, some electronic delays developed by IRA technicians could be set to accurately detonate a bomb weeks after it was hidden, which is what happened in the Brighton hotel bomb attack of 1984. Initially, bombs were detonated either by timer or by simple command wire. Later, bombs could be detonated by radio control. Initially, simple servos from radio-controlled aircraft were used to close the electrical circuit and supply power to the detonator. After the British developed jammers, IRA technicians introduced devices that required a sequence of pulsed radio codes to arm and detonate them. These were harder to jam. Roadside bombs were extensively used by the IRA. Typically, a roadside bomb was placed in a drain or culvert along a rural road and detonated by remote control when British security forces vehicles were passing. 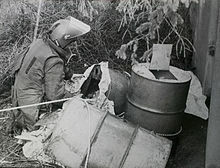 As a result of the use of these bombs, the British military stopped transport by road in areas such as South Armagh, and used helicopter transport instead to avoid the danger. Most IEDs used commercial or homemade explosives, although the use of Semtex-H smuggled in from Libya in the 1980s was also common from the mid-1980s onward. Bomb Disposal teams from 321 EOD manned by Ammunition Technicians were deployed in those areas to deal with the IED threat. The IRA also used secondary devices to catch British reinforcements sent in after an initial blast as occurred in the Warrenpoint Ambush. Between 1970 and 2005, the IRA detonated 19,000 improvised explosive devices (IEDs) in the Northern Ireland and Britain, an average of one every 17 hours for three and a half decades, arguably making it "the biggest terrorist bombing campaign in history". In the early 1970s, at the height of the IRA campaign, the British Army unit tasked with rendering safe IEDs, 321 EOD, sustained significant casualties while engaged in bomb disposal operations. This mortality rate was far higher than other high risk occupations such as deep sea diving, and a careful review was made of how men were selected for EOD operations. The review recommended bringing in psychometric testing of soldiers to ensure those chosen had the correct mental preparation for high risk bomb disposal duties. The IRA came up with ever more sophisticated designs and deployments of IEDs. Booby Trap or Victim Operated IEDs (VOIEDs), became commonplace. The IRA engaged in an ongoing battle to gain the upper hand in electronic warfare with remote controlled devices. The rapid changes in development led 321 EOD to employ specialists from DERA (now Dstl, an agency of the MOD), the Royal Signals, and Military Intelligence. This approach by the British army to fighting the IRA in Northern Ireland led to the development and use of most of the modern weapons, equipment and techniques now used by EOD Operators throughout the rest of the world today. The bomb disposal operations were led by Ammunition Technicians and Ammunition Technical Officers from 321 EOD, and were trained at the Felix Centre at the Army School of Ammunition. The Lebanese National Resistance Front, the Popular Front for the Liberation of Palestine, other resistance groups in Lebanon, and later Hezbollah, made extensive use of IEDs to resist Israeli forces after Israel's invasion of Lebanon in 1982. Israel withdrew from Beirut, Northern Lebanon, and Mount Lebanon in 1985, whilst maintaining its occupation of Southern Lebanon. Hezbollah frequently used IEDs to attack Israeli military forces in this area up until the Israeli withdrawal, and the liberation of Lebanon in May 2000. One such bomb killed Israeli Brigadier General Erez Gerstein on February 28, 1999, the highest-ranking Israeli to die in Lebanon since Yekutiel Adam's death in 1982. Also in the 2006 War in Lebanon, a Merkava Mark II tank was hit by a pre-positioned Hezbollah IED, killing all 4 IDF servicemen on board, the first of two IEDs to damage a Merkava tank. Homemade IEDs are used extensively during the post-civil war violence in Libya, mostly in the city of Benghazi against police stations, cars or foreign embassies. IEDs were also widely used in the 10-years long civil war of the Maoists in Nepal, ranging from those bought from illicit groups in India and China, to self-made devices. Typically used devices were pressure cooker bombs, socket bombs, pipe bombs, bucket bombs, etc. The devices were used more for the act of terrorizing the urban population rather than for fatal causes, placed in front of governmental offices, street corners or road sides. Mainly, the home-made IEDs were responsible for destruction of majority of structures targeted by the Maoists and assisted greatly in spreading terror among the public. Boko Haram are using IEDs during their insurgency. Taliban and other insurgent groups use IEDs against police, military, security forces, and civilian targets. IEDs have also been popular in Chechnya, where Russian forces were engaged in fighting with rebel elements. While no concrete statistics are available on this matter, bombs have accounted for many Russian deaths in both the First Chechen War (1994–1996) and the Second (1999–2009). Al Shabaab is using IEDs during the Somali Civil War. During the Syrian Civil War, militant insurgents were using IEDs to attack buses, cars, trucks, tanks and military convoys. Additionally, the Syrian Air Force has used barrel bombs to attack targets in cities and other areas. Such barrel bombs consist of barrels filled with high explosives, oil, and shrapnel, and are dropped from helicopters. Along with mines and IEDs, ISIL also used VBIEDs in Syria, including during 2017 Aleppo suicide car bombing. In the 1995 Oklahoma City bombing, Timothy McVeigh and Terry Nichols built an IED with ammonium nitrate fertilizer, nitromethane, and stolen commercial explosives in a rental truck, with sandbags used to concentrate the explosive force in the desired direction. McVeigh detonated it next to the Alfred P. Murrah Federal Building, killing 168 people, 19 of whom were children. In August 28, 2003, Marjorie Diehl-Armstrong, and three people plotted to make Brian Wells wear a fake collar bomb and rob a bank. What Wells did not know was that the plot was for him to wear a real bomb. When he met with the conspirators and was armed with the device, Wells stated that the bomb looked real and Diehl-Armstrong responded telling him it was. Wells tried to escape, but was recaptured by his accomplices. He was forced to go to the bank, where he demanded money, receiving only $8,702. Wells was arrested by the police outside the bank and handcuffed, Wells said that he had a bomb on him, about 30 minutes later, 3 minutes before the bomb squad arrived Brian Wells was pronounced dead, from the explosive device he carried. In January 2011, a shaped pipe bomb was discovered and defused at a Martin Luther King Jr. memorial march in Spokane, Washington. The FBI said that the bomb was specifically designed to cause maximum harm as the explosive device was, according to the Los Angeles Times, packed with fishing weights covered in rat poison, and may have been racially motivated. No one was injured during the event. On April 15, 2013, as the annual Boston Marathon race was concluding, two bombs were detonated seconds apart close to the finish line. Initial FBI response indicated suspicion of IED pressure cooker bombs. On September 17–19, 2016, several explosions occurred in Manhattan and New Jersey. The sources of the explosions were all found to be IEDs of various types, such as pressure cooker bombs and pipe bombs. Many IED-related arrests are made each year in circumstances where the plot was foiled before the device was deployed, or the device exploded but no one was injured. IEDs are in use in the ongoing War in Donbass and have also been used there for assassinations. IEDs were used during the Vietnam War by the Viet Cong against land- and river-borne vehicles as well as personnel. They were commonly constructed using materials from unexploded American ordnance. Thirty-three percent of U.S. casualties in Vietnam and twenty-eight percent of deaths were officially attributed to mines; these figures include losses caused by both IEDs and commercially manufactured mines. The Grenade in a Can was a simple and effective booby trap. A hand grenade with the safety pin removed and safety lever compressed was placed into a container such as a tin can, with a length of string or tripwire attached to the grenade. The can was fixed in place and the string was stretched across a path or doorway opening and firmly tied down. In alternative fashion, the string could be attached to the moving portion of a door or gate. When the grenade was pulled out of the can by a person or vehicle placing tension on the string, the spring-loaded safety lever would release and the grenade would explode. The rubber band grenade was another booby trap. To make this device, a Viet Cong guerrilla would wrap a strong rubber band around the spring-loaded safety lever of a hand grenade and remove the pin. The grenade was then hidden in a hut. American and South Vietnamese soldiers would burn huts regularly to prevent them from being inhabited again, or to expose foxholes and tunnel entrances, which were frequently concealed within these structures. When a hut with the booby trap was torched, the rubber band on the grenade would melt, releasing the safety lever and blowing up the hut. This would often wound the soldiers with burning bamboo and metal fragments. This booby trap was also used to destroy vehicles when the modified grenade was placed in the fuel tank. The rubber band would be eaten away by the chemical action of the fuel, releasing the safety lever and detonating the grenade. Another variant was the Mason jar grenade. The safety pin of hand grenades would be pulled and the grenades would be placed in glass Ball Mason jars, which would hold back the safety lever. The safety lever would release upon the shattering of the jar and the grenade would detonate. This particular variant was popular with helicopter warfare, and were used as improvised anti-personnel cluster bombs during air raids. They were easy to dump out of the flight door over a target, and the thick Ball Mason glass was resistant to premature shattering. They could also be partially filled with gasoline or jellied gasoline, Napalm, to add to their destructive nature. Houthis are using IEDs against Saudi-led coalition and Hadi's forces during Yemeni Civil War (2015–present), Saudi Arabian-led intervention in Yemen and Saudi–Yemeni border conflict. Al-Qaeda in the Arabian Peninsula and ISIL in Yemen are also known to use IEDs. ^ "home.mytelus.com". home.mytelus.com. Archived from the original on 2012-03-14. Retrieved 2012-05-11. ^ "Suicide Terrorism: A Global Threat". Pbs.org. Retrieved 2009-10-18. ^ "13 killed in blasts, arson in Sri Lanka". Chennai, India: Hindu.com. 2006-04-13. Retrieved 2009-10-18. ^ a b NATO Glossary of Terms and Definitions (AAP-6) (PDF). North Atlantic Treaty Organization. 2010. pp. 2–1–2. Archived from the original (PDF) on 2015-10-17. Retrieved 2012-11-28. ^ Smith S, et al. (2017). "Injury profile suffered by targets of antipersonnel improvised explosive devices: prospective cohort study". BMJ Open. 7 (7): e014697. doi:10.1136/bmjopen-2016-014697. PMC 5691184. PMID 28835410. ^ Cannon JW, et al. (2016). "Dismounted Complex Blast Injuries: A Comprehensive Review of the Modern Combat Experience". J Am Coll Surg. 223 (4): 652–664. doi:10.1016/j.jamcollsurg.2016.07.009. PMID 27481095. Retrieved 28 August 2017. ^ genel bakış (30 May 2013). "Insane IED Daisy Chain Attack in Syria" – via YouTube. ^ "JP 1-02 Department of Defense Dictionary of Military and Associated Terms" (PDF). Archived from the original (PDF) on 2008-11-23. Retrieved 2009-10-18. ^ "CBRNe World pages" (PDF). Archived from the original (PDF) on March 25, 2009. Retrieved 2009-10-18. ^ "FM 20-32 Chapter 13". Global Security. ^ Daniels, Jeff (17 March 2017). "Mini-nukes and mosquito-like robot weapons being primed for future warfare". CNBC. ^ "When broken down vehicles go boom! - WikiLeaks". ^ "Drone View Of New ISIS Car Bombs In The Battle For Mosul". YouTube. ^ Non Mirage Truth Vision (22 November 2016). "ISIS Using Suicide Trucks To Destroy Iraqi Tanks (Mosul Battlefield)" – via YouTube. ^ "+18 - "Islamic State" jihadists' VBIED attacks - March 2017 - Mosul, Iraq". ^ a b Jean-Pierre Steinhoffer : " Irak : les pertes de la Coalition par EEI ", in le Casoar January 2007. ^ "UK | Iraq boat attack personnel named". BBC News. 2006-11-14. Retrieved 2009-10-18. ^ "Americas | 'Horse bomb' hits Colombia town". BBC News. 2003-09-11. Retrieved 2009-10-18. ^ "Americas | Experts defuse necklace bomb". BBC News. 2003-07-01. Retrieved 2009-10-18. ^ "AMERICAS | 'Necklace' bomb halts Colombia talks". BBC News. 2000-05-16. Retrieved 2009-10-18. ^ Caniglia, John (July 11, 2007). ""Brian Wells" Erie bombing 'victim' was in on bank robbery". Plain Dealer. ^ "'Bomb' device attached to Mosman schoolgirl was a 'very, very elaborate hoax'". smh.com.au. 2011-08-04. Retrieved 4 August 2011. ^ "IISS Armed Conflict Database". Acd.iiss.org. Archived from the original on 2009-01-12. Retrieved 2009-10-18. ^ "DHS Warns Of Pregnant Prosthetic Belly Bombings". ^ a b c d e f Hunter, Major Chris (2008). Eight Lives Down. London: Corgi Books. ISBN 978-0-552-15571-7. ^ Lines, Andy (2013-08-16). "Breast implants suicide bomb threat: Heathrow on high alert over "credible" intelligence". The Daily Mirror. Retrieved 2013-08-21. Security has been beefed up after intelligence al-Qaeda is plotting attacks on airlines flying out of London. ^ Thielman, Sam (8 July 2016). "Use of police robot to kill Dallas shooting suspect believed to be first in US history". The Guardian. ^ Raw Leak (4 May 2016). "New tunnel bomb footage from Aleppo" – via YouTube. ^ World Conflict Films (5 March 2015). "Al Nusra Tunnel Bomb Collapses Syrian Intelligence Building In Aleppo" – via YouTube. ^ Londoño, Ernesto (July 10, 2008). "U.S. Troops in Iraq Face A Powerful New Weapon: Use of Rocket-Propelled Bombs Spreads". Washington Post. p. A01. ^ "A new type of Volcano rocket spotted in Idlib". Syria Direct. ^ a b World Conflict Films (15 May 2015). "Syrian Army Elephant Rockets Used Against Rebels" – via YouTube. ^ "'Elephant rockets' kill dozens in Damascus suburb". ^ "A new type of Volcano rocket spotted in Idlib". ^ lisa ann (4 May 2013). "Syria: Innovations for freedom #3 more DIY trebuchets, pipe weapons and vehicles" – via YouTube. ^ Harkin, Greg; Elliott, Francis; Whitaker, Raymond (2005-10-16). "Revealed: IRA bombs killed eight British soldiers in Iraq, ''This Britain'', UK — Independent.co.uk". London: News.independent.co.uk. Archived from the original on 2008-07-09. Retrieved 2009-10-18. ^ Independent.ie (2010-04-09). "independent.ie". independent.ie. Retrieved 2012-05-11. ^ John Pike. "Warlock Green / Warlock Red / AN/VLQ -9 or -10 SHORTSTOP Countermeasure". Globalsecurity.org. Retrieved 2009-10-18. ^ "Messenger, Scott (2009-03-01). "The Unmanned Mission". Retrieved on 2009-03-26". Unlimitedmagazine.com. Retrieved 2009-10-18. ^ State Archival Service. "Historical background". World War Two. Republic of Belarus, Ministry of Justice, Department of Archives and Records Management. Retrieved 4 Dec 2008. ^ "Belarus during the Great Patriotic War". History. belarus.by. Retrieved 4 Dec 2008. ^ Stockfish, David; Yariv Eldar; Daniella HarPaz Mechnikov (1970). Dokszyc-Parafianow Memorial Book — Belarus (Sefer Dokshitz-Parafianov). Tel Aviv: Association of Former Residents of Dokszyce-Parafianow in Israel. p. 274. ^ "Combating the No. 1 killer of troops in Afghanistan". CNN. 2010-05-06. Retrieved 2012-05-11. ^ Johnson, Andrew (2010-01-10). "Taliban make 'undetectable' bombs out of wood". Independent. Retrieved 2012-05-11. ^ "Reliable Explosives Detection Dogs - Patriot K-9". ^ "Sticky bombs, like those used in Iraq, now appearing in Afghanistan". Stars and Stripes. ^ "Sticky bombs showing up in Afghanistan". UPI. 23 July 2012. ^ Hashem, Mokhtar Awad, Mostafa. "Egypt's Escalating Islamist Insurgency". ^ "A dozen Egyptian security personnel killed in Sinai fighting". 23 March 2017 – via Reuters. ^ Sethi, Aman (2010-04-04). "Troop fatality figures show changing Maoist strategy". Chennai, India: The Hindu. ^ "Three blasts in Mumbai, 18 dead, over 130 injured". NDTV. Retrieved 17 July 2011. ^ "Blasts: ATS claims good leads, suicide bomber ruled out". DD News. Archived from the original on 17 July 2011. Retrieved 17 July 2011. ^ "Hyderabad blasts: Indian Mujahideen suspected, ammonium nitrate found on site - Latest News & Updates at Daily News & Analysis". 22 February 2013. ^ NDTV, NDTV (April 17, 2013). "Bangalore blast: Two kilos of explosives used, say police; CCTV footage offers clues". NDTV. Retrieved April 17, 2013. ^ Sudipto Mondal. "Explosions at village near Kudankulam plant: Reports". Hindustan Times. Retrieved 11 December 2014. ^ "Minor explosion at Church Street in Bengaluru". Deccan Herald. Retrieved 29 December 2014. ^ "Pathankot operation continues; 2 terrorists still holed up - Rediff.com India News". ^ "Pulwama terror attack: Suicide bomber drives SUV packed with 300 kg explosives into CRPF bus, 44 men martyred - indiatoday.in". ^ "More Attacks, Mounting Casualties". The Washington Post. September 30, 2007. Retrieved 2009-10-18. ^ "Middle East | Iran 'behind attacks on British'". BBC News. 2005-10-05. Retrieved 2009-10-18. ^ "Middle East | Blair warns Iran over Iraq bombs". BBC News. 2005-10-06. Retrieved 2009-10-18. ^ "British Official Warns Iran Not to Meddle in Iraq". Nyjtimes.com. 2004-06-08. Archived from the original on 2009-01-08. Retrieved 2009-10-18. ^ "Why ISIS Is Building Mad Max Truck Bombs". 23 February 2016. ^ "ISIS Forcing Children and Disabled People to Drive VBIEDs, Says Isler - Qasion News Agency". ^ "ISIS Releases Photos of Militants Using U.S. M113s as VBIEDS - Defensetech". 30 October 2014. ^ "LiveLeak.com - Islamic State VBIED compilation - Car/truck bomb attacks". ^ Eiran, Ehud (May 2007). The Essence of Longing: General Erez Gerstein and the War in Lebanon (in Hebrew). Miskal — Yedioth Ahronoth Books and Chemed Books. ^ "Boko Haram IED kills three soldiers in Borno". ^ Sawab, Ibrahim (14 December 2016). "Nigeria: Boko Haram IED Kills Another Lieutenant Colonel" – via AllAfrica. ^ Buari, Jasmine. "Just In: Boko Haram kills four people as Buhari marks one year in office". ^ "Nigeria: Troops Destroy Boko Haram IED factory, Rescue 4 Women, 6 Children". 24 March 2017 – via AllAfrica. ^ "Pakistan, IEDs and the law: an overview - AOAV". 5 March 2016. ^ Yousafzai, Salman (7 September 2016). "Why IEDs are weapon of choice for militants in KP". ^ "Majority of IEDs are traced to Pakistan - USATODAY.com". ^ "KDF soldier killed, five injured in al Shabaab attack near Kenya-Somali border". ^ NBS TV Uganda (3 September 2016). "AMISOM Calls for Support against Al Shabab's IEDs" – via YouTube. ^ "Bomb hits AMISOM convoy near Leego district – idalenews.com". ^ "Somalia: Huge Blast Targets Amisom Convoy, Two Dead". 23 July 2016. Archived from the original on 2017-10-18. Retrieved 2019-01-14. ^ "Like Afghan Counterparts, Syrian Rebels Now Using IEDs". 25 July 2012. ^ Rogoway, Tyler. "ISIS Used This Huge Crudely Modified Truck To Attack A Key Syrian Air Base". ^ "Suspect In Would-Be Airport Bombing Nabbed With Help From REI". ^ "NATO: IEDs: NEUTRALIZED: 49000 IEDs in Ukraine - Soldier of Fortune Magazine". ^ "Ukraine IED Incidents". nato-project.github.io. ^ Walker, Shaun (17 October 2016). "Prominent rebel warlord Arseny 'Motorola' Pavlov dies in Donetsk blast". The Guardian. ^ "Award-winning journalist killed by IED in horror blast 'which may have been meant for his partner'". 20 July 2016. ^ "Mine Warfare in South Vietnam". History.navy.mil. Retrieved 2009-10-18. ^ "American Experience | Vietnam Online | Transcript | PBS". pbs.org. Retrieved 2009-10-18. ^ "In Its Own Words". Hrw.org. Retrieved 2009-10-18. ^ "The Use of IEDs in Yemen". Worldwide Counter Threat Solutions. ^ Norton-Taylor, Richard (26 April 2016). "Number of civilians killed or injured by explosives rises 50% in five years". The Guardian. ^ Ram_Z (14 October 2016). "Yemen: Houthi IED Ambush on Pro-Hadi Convoy near al-Ba'aqa Crossing" – via YouTube. ^ News Of Yemen (8 February 2016). "Yemen war 2016- Houthis fighters destroyed Saudi M1 Abrams Tank by IED in Jizan" – via YouTube. ^ Al-Masdar News (26 January 2016). "Houthis ambush a convoy of Saudi Vehicles in Najran" – via YouTube. ^ YEMEN WAR (11 March 2017). "Ambush against a #Saudi military vehicle In Alhgelh site in #Najran" – via YouTube. ^ "When Houthis attack IV - March 2017 - Saudi Arabia". ^ "National C-IED initiatives: Middle East - Yemen - AOAV". 1 June 2017. Wikimedia Commons has media related to Improvised explosive devices. This page was last edited on 24 April 2019, at 08:47 (UTC).